Do you need to accept payments on your website? This seemingly simple task can quickly feel overwhelming when you begin exploring the various options for accepting online payments. Then, when you consider the complexity of security and the increased number of data breaches over the years, it’s clear that small businesses need to take precautions so they don’t risk being the next headline for a data breach. You have a simple need: you want to accept payments on your website. Clearent provides businesses and organizations various methods of accepting payments and donations to help them scale and grow. Our newest method, a payment button and hosted payment page, may be exactly what your company needs to get started with accepting online payments. The Clearent payment button allows businesses to add a payment option to their website by simply copying and pasting a few lines of code into their existing website. 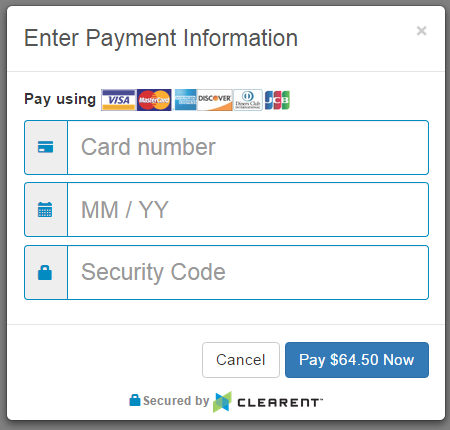 From there, the rest of the payment experience is hosted by Clearent. When a customer or donor visits your website and clicks on the payment button, a modal window pops up with a payment form hosted by Clearent. The customer or donor enters their payment information. They click the submit button. Clearent sends the browser a transaction response. If you don’t already have one, set up a Clearent merchant account. Complete the Payment Button request form. Go to our demo site and select from our simple Pay Now button or customize your own solution. You’re ready to take payments!